I am delighted to announce that Shield Maiden has won a Silver Award in the Literary Classic International Book Awards in the Pre Teen Fantasy section. Shield Maiden, by author Richard Denning, is an exciting children’s chapter book which takes place in a Saxon village in 7th century Mercia. Denning’s characters come to life in this mythological adventure, the story of a 12 year old girl who finds a golden horn in the ruins of a Roman villa. 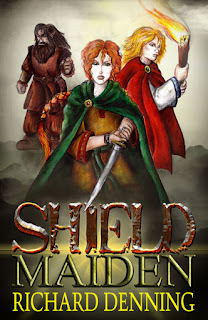 Shield Maiden, the first book in the Nine World’s Series, will hold great appeal for youngsters, regardless of their knowledge or understanding of Norse mythology; and kids interested in magic or fantasy are certain to appreciate the story of the Shield Maiden. Brief explanations of some of the Norse mythological characters are included at the conclusion of the story, adding a greater understanding of some of the events which take place in this exciting story. We recommend Shield Maiden for general reading, and as an educational tool to help youngsters gain insight and understanding into Nordic Mythology. Shield Maiden earns the Literary Classics Seal of Approval.